This is relevant because we are currently in Montpellier, located in southern France, about 12km from the Mediterranean coast. The fact that we don’t speak French feels like this secret that we’re carrying around with us as we walk the city streets. It’s something only we know and as long as we don’t open our mouths to speak, nobody will find out. Michelle mentioned as we were walking through the very popular Place De La Comédie that everything felt surreal, almost as if we were in a movie. I agreed completely, although I may attribute some of that feeling to the second hand copy of The Bourne Identity that I picked up for £1 back in Bishops Cleeve. We could both imagine Bourne appearing all of a sudden and racing through the square in a glorious action scene. While we feel uncomfortable, absorbing the language has definitely helped. We are both studying little pocket guides that we picked up in the London Luton airport, and we’ve been watching some French TV in our room. Between that and walking around town under constant bombardment from French advertising, it has at least started to feel more comfortable being in a place where your default reaction is to not understand a thing. We aren’t the first to visit a country and not know the language. Other tourists are in this town, so we aren’t abnormal. As long as we don’t freak out and run away, we’ll make it through any situation. We’re walking across Spain after spending a bit of time in France, so we better get over it anyway. With that concluded, I at least slowed my brain down and started to concentrate more. And so, the cafe on the side of the main square that we stopped at today went much smoother than the previous day’s excursion to the supermarket. Without the deer in headlights look, I explained in French that I don’t speak French. Irony, anyone? I then proceeded, also in French, to order one San Pellegrino with lemon and one coffee while only really screwing up the lemon, which in French is ‘citron’ rather than ‘limon’ or whatever it was I said. But the waitress understood, we got our drinks, we enjoyed our drinks, and all was well. This entry was posted in Travel and tagged France, language, Montpellier on May 22, 2011 by Jeremy Felt. 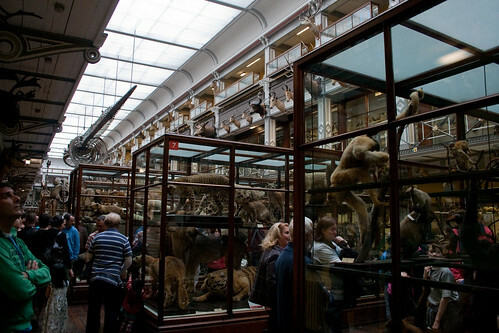 An absolutely fascinating display of animals from Ireland and around the world awaits you in the Natural History museum in Dublin. Opened in 1857, it is described perfectly by the pamphlet as a “cabinet style zoological museum” and mention is made that the collection on display has changed little in the last century. My favorite exhibit in the museum stares down at you in the form of three massive giant Irish deer skeletons that greet you upon entering. As you start to imagine a world in which these animals are roaming the country side, you look down a seemingly endless row of display cabinets. The collection continues on the second floor, even more tightly packed than the first. Each step you take creaks on the wood floors that are more than likely well over a hundred years old. Staring at you from every angle are bison, apes, sloths, koalas, polar bears – and when you look up you see yet another two levels of display cases lining the walls, inaccessible due to current safety regulations. And if all that weren’t enough, a massive 66 foot long fin whale skeleton hangs above the room for inspection. If you have the chance to enjoy this now, do. Messaging inside the museum implies that a new building is being readied and the collection will soon be moved and expanded. There is no doubt that this will enable a more extensive display, but one can imagine that some of the charm of standing in a 19th century museum will fade away. The museum is open every day but Monday, and admission is free. One could quickly browse the entire collection in 20 minutes or find themselves staring at different species of Irish birds for days. This entry was posted in Travel and tagged Dublin, Ireland, Museum on April 27, 2011 by Jeremy Felt. The owner of Captain Halpin’s Bunkhouse in Wicklow, knowing that we were without a car, looked at us with surprise when she asked where we were headed next and heard Dungarvan. A slight look of disbelief came across her face until I rattled off the bus numbers. Once she saw that we had done our homework, her face relaxed. As long as you know the buses you’re taking in advance, Bus Eireann does a great job of getting you almost anywhere you want in the country. And so we made our way down to the bus stop across the street from the Grand Hotel in Wicklow at about 9:15 with plenty of time to spare. The bus pulled around the corner just a minute after schedule and we loaded our bags into the luggage area underneath. We climbed onto the bus and the driver asked where we were headed. The bus driver gave us a familiar look of surprise and I started to cringe. He did however quickly agree that it was possible as long as we knew we were changing buses a couple of times. He took out his book to look up the routes and zones, typed them into his fare calculator and we were good to go. Really not too bad when you think that we’re taking 3 buses over a period of 4 hours and working our way across a good part of the country. The bus started off almost empty. Even after the next two stops, only a couple more passengers boarded. Also, surprising enough, this bus had more leg room than the one we had taken down from Dublin the other day. Gorey was the first stop with some real action. Several people got off the bus and a good ten or so boarded. As we pulled away from the stop, the sun broke through the clouds. This was welcome to us as the forecast had called for a rainy day. We continue to be surprised at how much sun we’ve been blessed with over the last week. Doesn’t seem characteristic of Ireland at all. Pulling into Enniscorthy, it is immediately apparent that this is a major hub. Busy streets are routed around the river through town with at least two bridges in a short space. If it were expanded out a few kilometers, it could be much like Dublin. It was here that we disembarked the first bus to make our connection to Waterford. There was a slew of people lined up in front of the Bus Stop Shop on one of the main drags by the time our bus arrived. From the brief look at the timetable, several other Bus Eireann routes head through frequently and the airport coach from Dublin to Wexford stops as well. It does make sense with direct enough roads going in each direction out of town that it is such a hub. After waiting about 25 minutes, we boarded our next bus without event and started on our way again. As we left Enniscorthy, it definitely felt like we were climbing a lot. Every so often we broke through the hills and trees at the same time the sun broke through the clouds and greeting us were beautiful rolling hills of green lit up with spots of yellow from the gorse. A very gorgeous portion of the ride indeed. Waterford is as big as you’d probably expect from looking at the map and being familiar with Waterford Crystal. A big town, and the first bus station of our trip. We had about a 20 minute wait for the next bus here, so we took that opportunity to eat the sandwiches we had packed up the night before. The route 040 bus that picked us up in Waterford continued the trend and was smaller than the one before. This also happened to be the shortest leg of the day’s journey. Although short, the roads were able to rock me to sleep almost immediately. A fantastic view greeted us when we came over the last hill and started working our way down into Dungarvan. The sea and the bay were surrounded by hills and you could see the beauty even through the slight haze of the afternoon cloud cover. We were excited to arrive and headed straight to the tourist information center to check on the location of the hostel we were looking for and to see if any other hostels were in town. An “out to lunch, back at 2pm” sign greeted us but soon after a lady came in and unlocked the door. We asked about the hostel and she seemed a little surprised that we were there. There are no more hostels in Dungarvan. Ahh. That would explain why the webpage with daily rates was from 2003. Apparently they shut down 2 years ago and there are no other hostels. This is a little surprising as Dungarvan seems to be pushing towards a tourist clientele, but it may be that the general backpacker doesn’t make it down this way too often. So the post title changes. The Bus To Youghal it is. We still had some time to pass, so we found a small cafe up the narrow stairs of a building on one of the side streets in town. After a coffee, soda, and two rhubarb tarts, we were ready to go. The bus stop out is the same one as the way in, so we didn’t have to work too hard. After waiting around 10 minutes, we saw the bus come through the roundabout. At this point, things got a little confusing. I asked the bus driver for 2 singles to Youghal and when he replied with the price, my brain did the math to be a total of €26, which seemed way too high a price to pay just to go 20 or 30 km. I asked for the fare to Cork instead and with a sigh or a grumble, he gave me a price of €32. In hindsight, I am pretty sure I miscalculated the first price, and it was a lot cheaper, but I didn’t want to get stuck paying another €20 to get to Cork if there was no lodging in Youghal. Some money lost, maybe a lesson learned, we purchased our fares to Cork and got off the bus a short ride later in Youghal. The trip wouldn’t be complete without a bit of effort, however. Assuming that the town of Youghal was small in comparison to others in the area, we got of the bus at the first stop and started to walk into the town centre with our packs. A couple kilometers later, we started to wonder. The little flier we had was not only unclear about the location, it was also not to scale. When we did finally reach the beach on the other side of town, we gave in and decided to call. Actually I should say that I gave in. I’m pretty sure that Michelle was ready to call soon after we started walking. There was no answer at the hostel number, but another number was given. At the second number, we reached a woman who was out of town but was able to give us her husband’s number and the code to enter the hostel and drop off our bags. Luckily enough, it was then that we also found out the hostel was only another block or so away. We walked into the hostel and dropped or bags off before calling the third number. When we did, we reached a man who was due to be back in town within an hour or so. He told us that we were welcome and to pick a room and put our bags there. And that is how we got to Youghal. This entry was posted in Travel and tagged bus, Dungarvan, Enniscorthy, Ireland, Wicklow, Youghal on April 26, 2011 by Jeremy Felt. Youghal is a beautiful town so far with an immense amount of history. Tomorrow we’ll have a chance to explore more, but a few things have already been learned in the last few hours. Youghal is pronounced ‘Yawl’. Or at least according to some flier we saw today. I don’t think it’s as easy a pronunciation as the y’all that Americans may be familiar with, but similar. There is more than one bus stop in Youghal, and only one hostel. The hostel is very close to a bus stop, but on the opposite side of a very long town from the first bus stop. If you get off at the first stop, near ‘town centre’, you will enjoy a log walk. Beamish is not a bad stout. In fact it was interesting enough to try again, even though my brain is wired for Guinness. It was also €0.60 cheaper than other stouts at the time of our visit, so that may have played a part. There you have it. Another post is forthcoming detailing other things I’ve learned today, but these have just appeared in Youghal. This entry was posted in Travel and tagged Ireland, tips, Youghal on April 26, 2011 by Jeremy Felt. After striking up a conversation with another hostel guest about the ska band (Boc Social) we had all seen at Leitrim Lounge in Wicklow the night before, we quickly found ourselves with a generous offer to ride along with him and his son as they drove to Laragh to do a hike through the hills around the area. We gladly accepted. We had one other opportunity to travel into the mountains via private bus, but that only went up on Saturday and cost €20 a person. Until Thomas and Lucas from Switzerland appeared, it seemed that we would have to skip seeing that area. Around 11:30, we all packed into the rental car and made the short 30 minute journey to Laragh. After a very short time hunting for a trailhead, we found a parking lot near St. Kevin’s Church that we could use as a starting point. Once started, we headed almost due North out of Laragh on the Wicklow Way. After ascending quickly for the first hour or so, we rounded the top of Paddock Hill at 360 meters and were able to enjoy beautiful panoramic views. As we headed back downhill, we left the Wicklow Way and ended up on some other fire roads and side roads almost the entire rest of the way. We headed east to Annamoe, crossing the river there. We then headed south a while before moving west again. We crossed the river again almost straight east of Laragh and then spent the last 2 km on a fairly busy road. All in all I would guess that we walked a total of 14 km. I’ll admit that the first portion of the walk climbing up on the hillside was the most breathtaking. Most of the second half was spent amongst the trees and didn’t offer the same views. The whole walk was fun however, and we had great company. Once back in town we stopped for a quick meal and well deserved pints at The Wicklow Heather in Laragh before heading back to the car. We arrived back at the hostel around 17:30 or 18:00. A good, full day. This entry was posted in Travel and tagged Hiking, Wicklow on April 25, 2011 by Jeremy Felt. Possessions are a funny thing. Seems like you never have enough until you have too much. This adventure that we’re embarking on today has been well over a year in the making. In that time we’ve been able to reduce our overall footprint to pretty much what you see in the first photo. Nine big tubs, a few extra random small tubs, some kitchen appliances, and a wonderful vacuum cleaner. A few other things aren’t pictured, namely the bikes out at my parent’s house in Denver, but this is about all. So much work went into getting things down to this amount, which even now seems like way too much. I think there are many lessons to learn from this trip, and this will be one of the things that will take a while to process. For now, thanks to wonderful friends and family that hold on to things for us, we’ll forget about our possessions and learn to live with what we have. Which brings us to the second picture, the stuff that we will have to worry about. Not much, thankfully, but ready to load up and head on our way in about 10 or 15 minutes. This entry was posted in Travel on April 18, 2011 by Jeremy Felt. If we’re going to have a travel blog, at least some mention should be made as to where we are headed before we start to arrive. Future posts will more than likely go into more detail, but this is what we know so far. We leave Chicago today, at 6:45pm local time, and fly to Dublin on Aer Lingus. After arriving in Dublin, we’ll need to find a hostel to stay in as we never planned that far ahead. After a few days enjoying the city, we’ll probably be ready to move about the country. While we’re huge fans of the West coast in Ireland, we’ve never made it South, so there is a good chance travel will start off in that direction. Once we do get far enough West, we’ll head back up to Killarney to meet up with friends, have a few walks in the National Park, and visit all the familiar spots. This is all subject to changes on the whim and could end up being completely different than described. The only thing we know for sure is that we’ll need to hop on a Ferry from somewhere to Holyhead, Wales on May 5th. We’ll stay one night in Holyhead and then hop on the train to London Euston in the morning. Once we’re in London, we’ll have a day to bum around by ourselves before our good friends join us for a couple weeks of traveling through England and Wales. We know for sure that we’ll be in London through May 12th and then up to Oxford for a couple nights in one of the colleges. After the stay in Oxford, we’ll be back to winging it. By then everyone will have a good idea of what we want to see and where we want to see it from for the next week before returning to London for one more night. May 21st, our friends will leave us in London. Michelle and I will hop on the train from London to Paris and spend a few days seeing the sights and determining whether or not we should come back and spend some real time one day. Some time in the last week of May, we’ll take another train down to Bayonne in South-West France. Depending on how things are going, we’ll either quickly or slowly work our way towards Saint Jean Pied de Port, where the Camindo de Santiago will begin for us. For the next so many days (probably 40ish), we’ll be walking on foot with our packs from Saint Jean Pied de Port to Santiago de Compostela as part of the very popular pilgrimage. That’s where the fairly detailed stuff ends. If all goes well, the next stop may be near Istanbul, where we have a good lead on a farm that we could work at in exchange for room and board. Either way, we’ll need to hop away from the Schengen Area for a bit in order to make it easier to manage the visa requirements of a US citizen traveling long term in Europe. Our plans go to completely wide open once the walk is done, so we won’t know until we get there.